Stating that sleep is an essential biological process seems as obvious as saying that the sun rises every morning. Yet, researchers' understanding of the molecular mechanisms underlying the effects of sleep loss is still in its earliest stages. The risk for a host of metabolic disorders, including weight gain, diabetes, obesity, and cardiovascular disease, associated with reduced sleep is driving basic investigations on the topic. 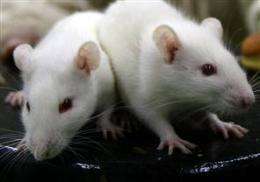 When they compared the list of significantly altered metabolites in rats and humans compared to the baseline before sleep restriction, they found that two metabolites—oxalic acid and diacylglycerol 36:3 – were depleted under sleep-restricted conditions and restored after recovery sleep in both species. Oxalic acid is a waste product derived from processing foods in the diet such as plants, primarily from the breakdown of vitamin C and some amino acids. Diacylglycerol is a precursor molecule in the production of triglycerides, a molecule in which most fat is stored in the body, and also has a function in signaling in cells. The researchers suggest that these two molecules could serve as potential biomarkers since they are present in both species.